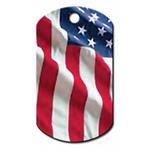 Show your love for your pet and love of the country with the USA Flag Engravable Pet I.D. Tag Large Military Tag! The American Flag Engravable Pet I.D. Tag will ship to your door, ready to use. Don't let your pet leave your house without I.D. so they know how to get back. Made with a brass metal base then painted on front and back. Look for other charms to enhance your tag's bling. * After adding to cart, you will add your pet's information. Heavy duty, durable and sleek looking! Posted On 01/23/18 by Heather M from IGH, MN Yes, Heather M recommends this product! Beautiful tag; Heavy duty, durable and sleek looking! I enjoy your products that are offered.